Protein powder is one of the most popular sports supplements for athletes and people who want to gain muscle mass. However, getting enough protein can easily be done by eating protein-rich foods. Extra protein from protein powders is rarely needed. 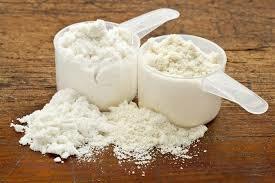 Protein powders can be costly and do not have any benefits over a balanced diet. What are the advantages of eating protein-rich foods? Protein-rich foods provide vitamins and minerals and other nutrients that are good for your health. Aim for a diet that provides protein-rich foods like milk, yogurt, lean meat, fish, chicken, legumes, soy products, nuts and seeds. If I do use protein powders what should I look for on the label? Look for a protein powder that has a mix of protein sources. Some proteins are digested more quickly than others. Find a protein powder that has whey (milk), casein (milk) or soy protein. Try to avoid extra fats, sugars and artificial sweeteners in protein powders. How much protein powder should I use? Use about 20 grams of protein powder right after your sports activity. This will help the most to increase your strength and muscle mass. Remember, more protein powder is not better. Too many calories whether from protein powders or food may lead to weight gain.